Austin Jenkins, President-Elect; Charles Battersby, BOD; Lorraine Herbert, Treasurer; Scott Peckins, Secretary; PDG Klaus Hachfeld, Executive Secretary; David Zonia, President; Otto Prohaska, Immediate Past-President; Bob White, BOD. Missing from the photo is Peter Zeh, BOD. Many friends and family members attended to celebrate the event. Because Dr. Zonia is an avid golfer, the installation ceremony and activities carried a golf theme, much to the enjoyment of those attending. A choice of a prime rib or salmon dinner was served and enjoyed by all. Looking forward to another productive and successful year! Fellowship, Community Garden and Farmers’ Market – all in one night! We had a very unusual meeting and fellowship evening at a member’s home that turned out to be not only enjoyable but very interesting and challenging as well. 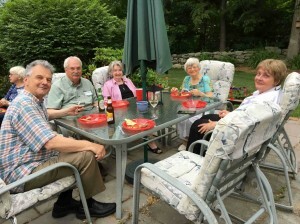 Following socializing with appetizers and then dinner, our two guest speakers, who have become known to Rotary members, gave their presentations. 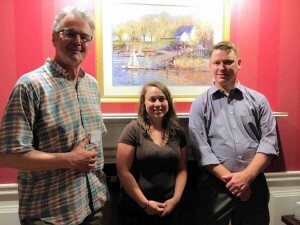 First was Joe Coan who had spoken with us last year about helping us start a Community Garden. Joe has done some research on the site we had chosen and much discussion took place as to what needs to be done to launch the Community Garden as one of our next projects. We’ll be reporting more as this project takes shape. 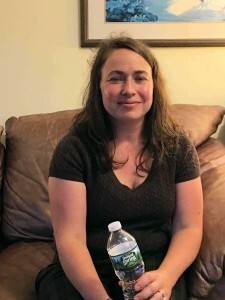 Our second speaker, Becky Skowron Gendreau, had also spoken with us twice in the past. Becky brought us up to date on her new farm and her plans to start a Farmers’ Market in Sturbridge. Sturbridge Rotary had sponsored Becky several years ago to travel to South Korea for four weeks as a member of Rotary’s Group Study Exchange Team. It was great to see them both again and we look forward to working more with them as we plan and develop our community projects. 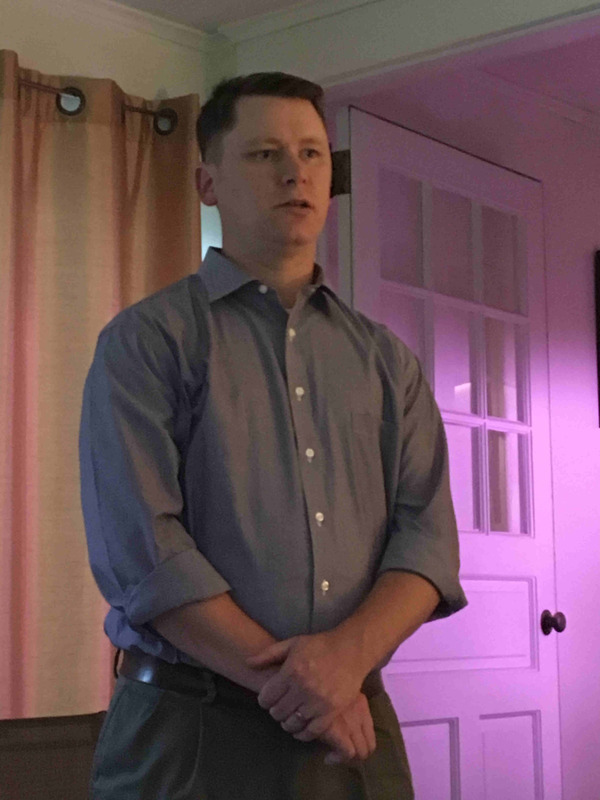 Congratulations of Carl Kaliszewski for receiving a Paul Harris Fellow (PHF) +8. That means that when Carl first became a PHF, he received a PHF pin. He continued over the years to receive eight more PHF pins each with another sapphire stone on the pin. Carl has been a very strong supporter of the Rotary Foundation since his induction as a Rotary member in 1993. 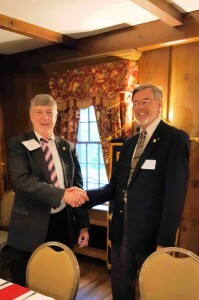 He has always been involved not only in the Sturbridge Club but on the District level as well. Carl has served as President twice and as District Governor from 2004-2005. Rotary appreciates your continued service, Carl. PDG Klaus Hachfeld (right) presented the PHF+8 honor to Carl. We have a few spots left for a great day of fun, prizes, food and laughter. Sign up NOW! 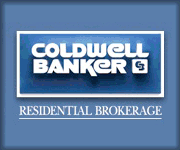 Click on the Brochure for details. 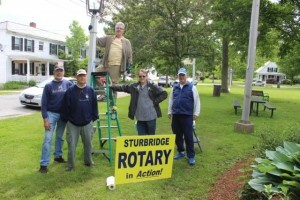 The Sturbridge Lions Club and the Sturbridge Rotary Club have joined forces to sponsor an event being held on Sturbridge Common on Thursday, July 20th from 6-8 PM. 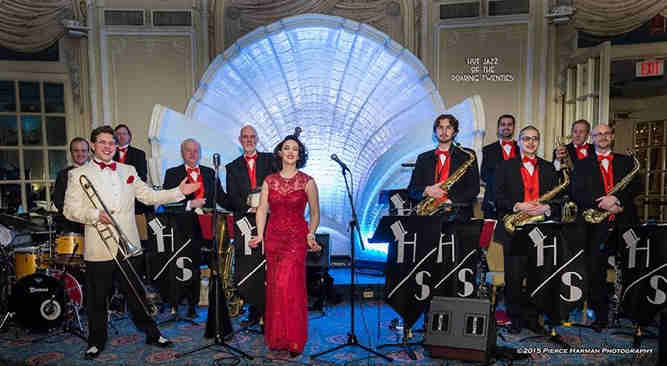 The event, FREE to the public, is a concert by Dan Gabel and The Abletones, an 18-piece Big Band specializing in swing music of the 1930s and 40s. 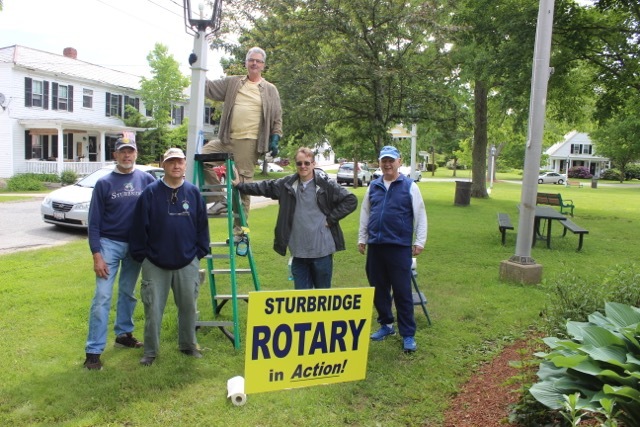 This is not the first time that Sturbridge Lions and Sturbridge Rotary have partnered for the benefit of the greater Sturbridge community. 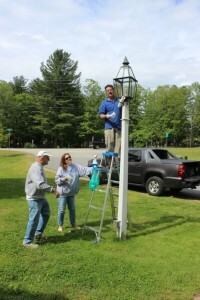 Together, the two Clubs contributed to the construction of the bandstand and lanterns on the Sturbridge Common, the very site where The Abletones will be performing. 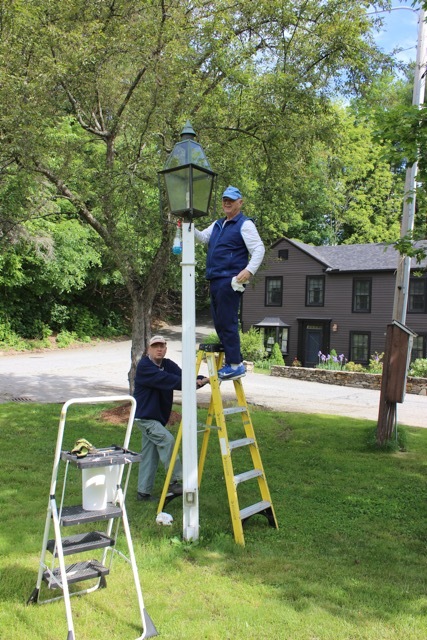 Recently, the two Clubs cleaned and repaired the antique style lanterns which light the Common. We invite you to come and enjoy the concert – rain or shine. 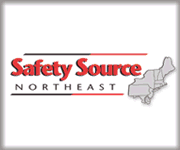 There will be raffle tickets available for purchase which includes a night’s stay for two people at the Publick House including dinner and breakfast. Bring the whole family, bring friends, bring neighbors and don’t forget your lawn chairs. If your feet start tapping, get up and dance! Sturbridge Rotary Club has been awarding scholarships each year to local students for the past 44 years. 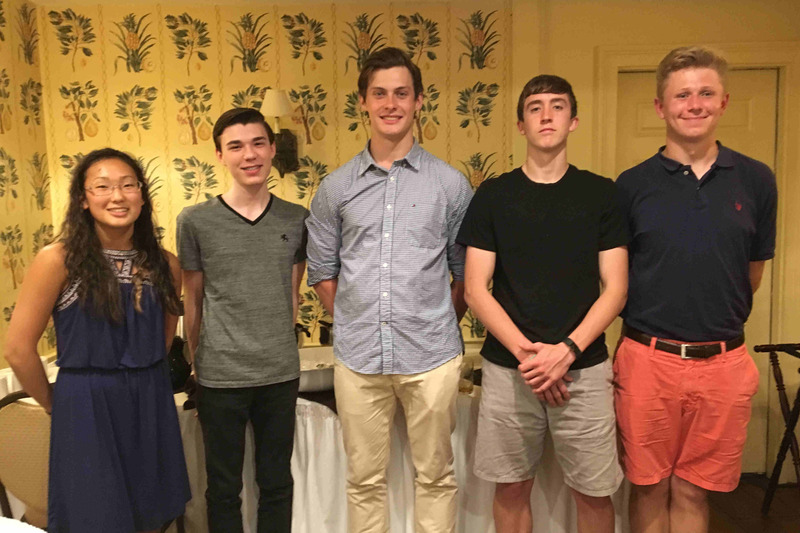 This year scholarships of $1,200 each were awarded to five students from Tantasqua Regional High School. The money will be given after successful completion of their first semester of college. Cumulatively, the amount of scholarships given is over $195,000. 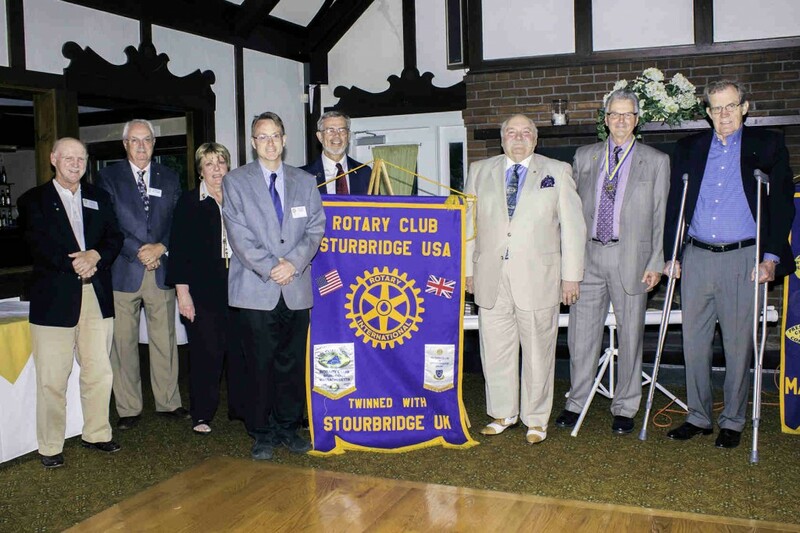 In addition, a $500 award was presented in memory of the husband of a Sturbridge Rotarian. Emma Stanley from Brimfield will attend UMass Amherst. Emma received the Wendell Wright Memorial Educational Award. Maxwell Cooney from Sturbridge will attend UMass Boston. Bennet Farrell from Sturbridge will attend UMass Amherst. Adam Phillips from Brookfield will attend Anna Maria College. Noah Scott from Brimfield plans to attend Georgetown University, pending acceptance. Camier Hall from Fiskdale will attend Union College. 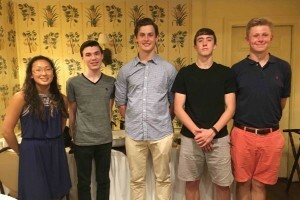 Unfortunately, Camier was unable to attend the Club’s Scholarship Recognition Night. Our congratulations and best wishes to all scholars as they pursue their career goals. Several members from both the Sturbridge Rotary and the Sturbridge Lions Clubs spent time recently cleaning all the antique lamps that light the Sturbridge Common. Both Clubs had contributed to purchase the lamps when the bandstand was built as well as contributing to the construction of the bandstand. The cleanup is in preparation to both Clubs jointly funding the July 20 Concert on the Common featuring Dan Gabel and the Abletones. Those who helped from the Lions were Laurie LaFleche, PDG Terry Grant, Randy Peppard, Neil Cooper and Guy Martel. Those who helped from Rotary were PDG Klaus Hachfeld, President Otto Prohaska, Austin Jenkins, Peter Zeh and Scott Peckins. Thanks everyone for bringing ladders and cleaning supplies to get this job done and done so quickly. Two service clubs working together for the good of our community!